Whether celebrating pentakills and promo wins, or agonizing together over a streak-busting throw, League is better with friends. So we're adding a trio of new features during the 2016 season to help you build and join communities of like-minded players, make it easier for premades hitting the rift, and help everyone keep in touch while afk with a new League chat app for iOS and Android. Clubs, Parties and the League Friends app are foundational features. This means that while their official launch is early next year, we're going to be building them up and working on them throughout the 2016 season. Out the gate, each club provides a persistent chat room that lives across login sessions for all clubmates. This social hub facilitates friendships and naturally provides a place to organize games. Club leaders wield a full set of moderation tools, allowing them to invite or kick members at any time. Leaders can share the management burden, unlocking invite and kick powers for chosen officers. At launch, clubs max out at 50 members, but we'll likely increase that number over time. What's in a club? Well, that's entirely up to you. From esports fans to collegiate gamers, clubs can form around just about anything. 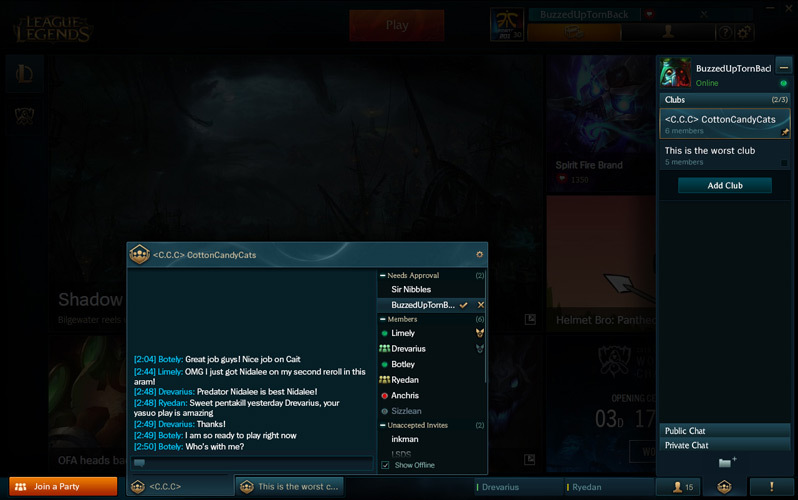 And as a bonus, you can rep your club on the Rift with tags attached to your summoner name. Just as a note: because you can be a part of multiple clubs at the same time, there'll be a way to swap which tag you sport in-game. 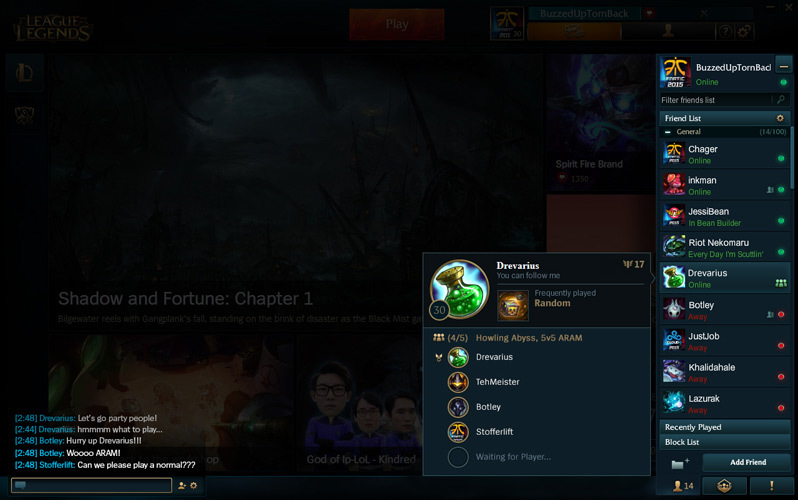 Parties are open by default, meaning friends will see your party in their friends list, know you're looking for people to play with and be able to join you with just a few clicks. Party leaders can close parties too, making them invite-only. The League Friends app is now available! Learn more here. Use the League Friends app to hit up your buddies for a match any time they're available—even before they've booted up their rig. 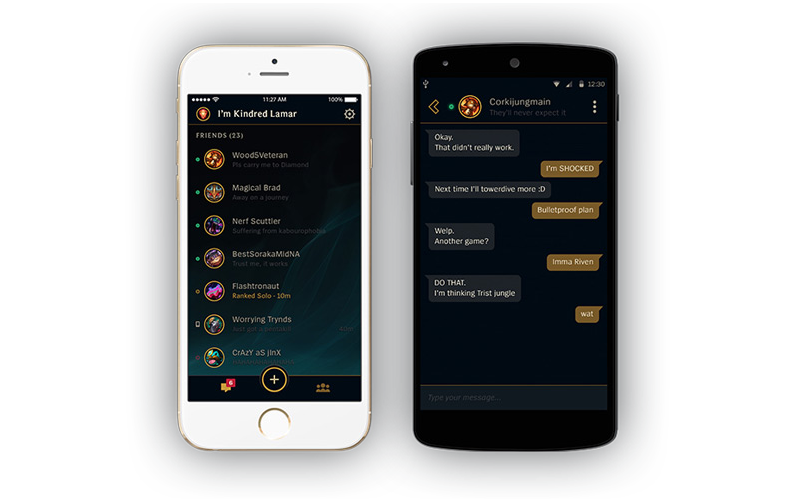 The app syncs your conversations from any device, so you can keep up the team trash talk long after smashing the enemy nexus. It's a lot easier to organize your team games when everybody is online. Optional push notifications ensure that you'll get the message when your squad feels a late-night itch for a 5v5. Like we mentioned up top, Clubs, Parties, and the Friends app are early efforts that we plan to ramp up significantly. Clubs can look toward a future of challenges that clubmates can only face together and search functionality is also in the cards, which should help players without a huge friends list find clubs to join. The League Friends app is available (totally free) for Android and iOS right now. You can expect it to keep evolving over time, supporting features like Parties and Clubs when they become available.